Convert Hotmail Emails to PDF automatically. You are here: CoolUtils > Total Image Converter > Convert Hotmail Emails to PDF automatically. Total Image Converter is a one-stop-solution for all your image needs. 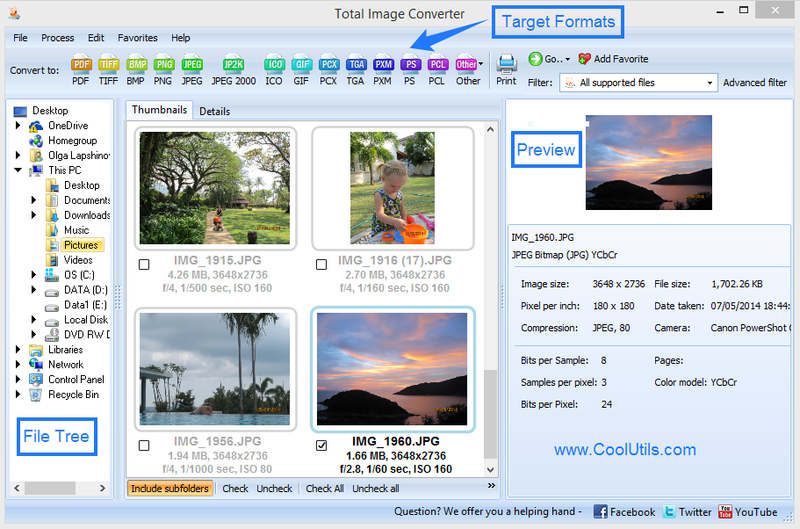 Total Image Converter enables you to convert, resize, crop or add watermarks to the images. All these can be done with just a few clicks. The important feature of Total Image Converter is its ability to compress images without losing quality. Compressing the image reduces the size of the image, which in turn reduces the time taken by the web page to load. The process of reducing the image size can be performed in either ways - convertiing images to PNG format or resizing the number of pixels. Total Image Converter also helps to recover old images from unsupported formats. Batch processing is another import feature that helps to process multiple images simultaneously. You can select the required files or simply click the "Check All" button to select all the files. You can convert or resize any number of files simultaneously in just a click. 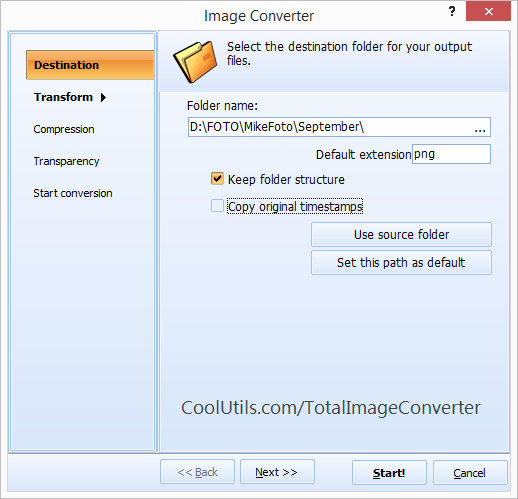 Total Image Converter has an easy-to-use interface, which allows you to self-explore the application. The images are displayed inside the application before and after the conversion. The view of the application can be switched to the Details view which displays the file name, size, type, modified and attributes or to the Thumbnails view. Once installed, Total Image Converter integrates seamlessly with the Windows operating system, which means you can convert the image file to any format directly by selecting the image file and selecting the "Convert to" option from the context menu that appears than opening the application to convert it. Total Image Converter supports command line as well. 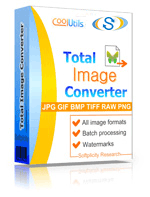 Total Image Converter application is offered free for a period of 30 days. The price of the product is very less compared to other similar products in the market. There is no hidden cost involved and once paid, you will receive all updates absolutely free. Technical support is available to the registered users.